The whole family can participate in a bike ride. 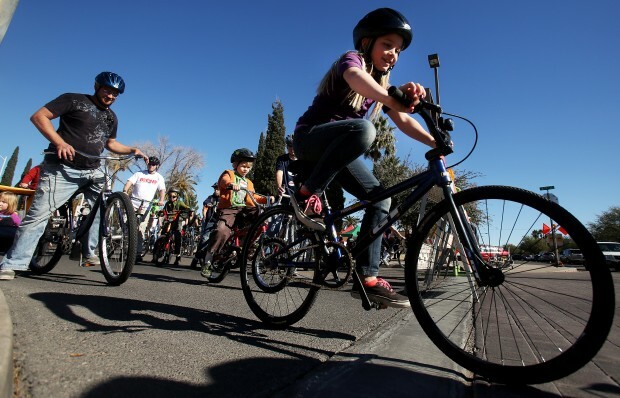 Kids and parents head on out a 2-mile family bike ride during the BEYOND Tucson Main Event on Saturday, Jan. 5, 2013. UDATE: Due to weather, the first Tour de Biblio scheduled for Friday, Feb. 22 has been cancelled. The ride planned for March 9 will continue as planned. Please check the Facebook event for information about future rides and updates. 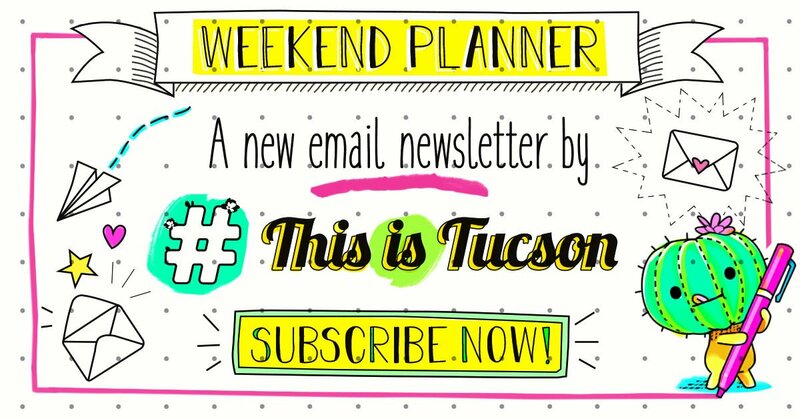 If you think bikes and books belong together, it's a good thing you live in Tucson. The Pima County Public Library is launching its first Tour de Biblio — a group ride between several library branches. The first library road trip on Friday, Feb. 22 will start at the Joel D. Valdez Main Library and cruise to the newly-remodeled Sam Lena-South Tucson Library, Santa Rosa Library and then back to the downtown branch. That's a 4-mile ride — and one that you could ride on a Tugo bike. "We want people to realize that there are safe routes to bike to your library, so you don't have to hop in the car," says librarian-on-the-move Karen Greene, one of the organizers of Tour de Biblio. "There are a lot of places that feel far away, but once you go on a safe bike route to them, you're like, 'Oh, I could do that.' We want families to be comfortable with the idea of biking to the library." The next ride, on Saturday, March 9, will go from the Himmel Park Library to the Woods Memorial Library to the Martha Cooper Library and then back to the Himmel branch. That one is about 15 miles, but Greene says it's doable, even if you don't have a ton of experience with group rides but are up to a challenge. Pima County Bike Ambassadors will be there to teach you rules of the road and how to ride safely as a group. "I will say, I ride a three-speed bike, and most of my bike trips are 1 to 2 miles, and I could do this," Greene says of the midtown ride. If these are successful, Greene says they'd like to organize future rides in other parts of town. Each ride will include snack stops at the branch libraries and a Bookbike magnet craft. The library's Bookbike won't be participating in either ride, but Greene says rides may include stops at Little Free Libraries along the way. If your bike needs a tune-up, Living Streets Alliance will host bike clinics the day before each ride. Register for those by emailing colby@livingstreetsalliance.org. There are 30 spots on each bike ride, so make sure to register in advance by going here for the February ride and here for the ride in March. All riders need to bring helmets, and minors must ride with a parent or guardian. "It might take 10 minutes longer to bike than to drive, but there is fun stuff to look at on the way, whether it's a park you didn't know about or public art or Little Free Libraries," Greene says. "You can get places and have fun with it." When: 9:15 a.m. Friday, Feb. 22 and Saturday, March 9. Where: Start at the Joel D. Valdez Main Library, 101 N. Stone Ave. for the Feb. 22 ride; start at the Himmel Park Library, 1035 N. Treat Ave. for the March 9 ride. More info: Go here for more information. The second ride will go from the Himmel Park Library to the Woods Memorial Library to the Martha Cooper Library and then back to the Himmel branch. Adorned by the desert's poets.